Most visitors to Las Vegas might not realize it, but just about one hour away from the Strip, the palm trees, and the 100+ degree summer heat is something completely different and unexpected. Mount Charleston is not the highest point in Nevada, but with its peak at nearly 12,000 feet, it offers everything you’d expect from a mountain environment. That means forests with pine trees, cooler summer temperatures, and enough snow in the winter to support a ski resort. But why should we be surprised? Las Vegas has everything else to offer. From the Sphinx, to the Brooklyn Bridge; from the Eiffel Tower to the Coliseum; from gondolas to a volcano, Las Vegas has it all. It is nice to know, however, that there are places not far away where you can escape all the excitement and enjoy some more peaceful surroundings. 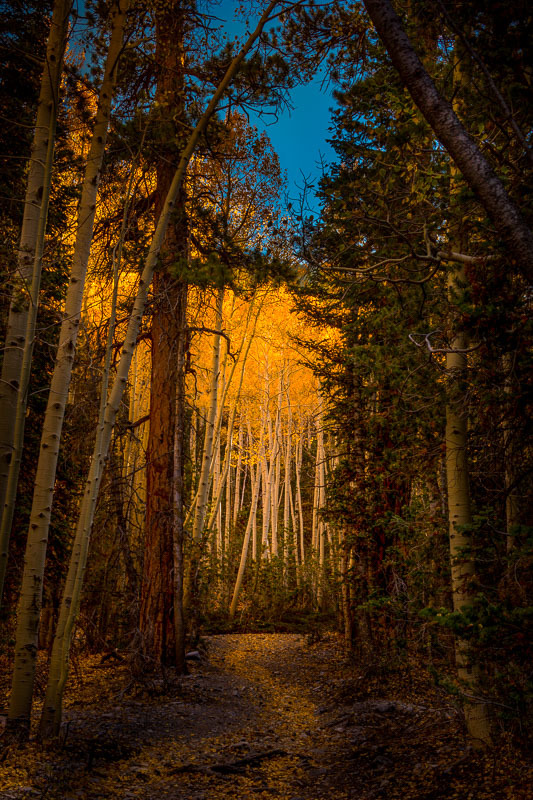 I visited Mount Charleston at the beginning of October specifically to photograph the Aspen trees, which I knew to be close to their peak in color. Towards the end of my day hike, I was heading back without having made the photograph I really wanted. Then I turned around and saw the scene above. I had just left that grove of small, colorful Aspens a few moments earlier and failed to find a photograph that I really loved. Who knows what made me turn around, but I instantly knew I had found my photograph. This was exactly the kind of photograph I was hoping to make that day. As I was heading out of the trail, somehow I ended up on the ski slope near the lodge. I headed down and found a wedding reception taking place in a large tent outside the resort. When the out of towners received their invitation to a wedding outside of Las Vegas, I wonder how many of them imagined it would take place in these surroundings.